THIS year marks Dhaka's 400th anniversary as a capital city. However, Dhaka's history as a town or an urban settlement goes back much further, and it is very difficult to say exactly how old Dhaka city is. King Srigupta of north Bangladesh laid down the foundation of the illustrious Gupta Empire (320-550 AD). Harisen, the poet-laureate of Emperor Shamudragupta, who was the grandson of Srigupta, mentioned Dabaka in Allahabad Prashasti, in his eulogy for the Emperor, written in the 4th century A.D. The Dabaka mentioned in that inscription refers to today's Dhaka. King Ballal Sen, the second ruler of the Sen Dynasty (1159-1179) built the Dhakeswari temple in Dhaka more than 800 years ago. No trace of that temple remains, but the four Siva temples erected by Raja Man Singh, the commander-in-chief of Emperor Akbar, at the site of that temple in the wake of the 17th century still stands. Man Singh stayed in Dhaka from 1602-04 when he was fighting against Isa Khan, the leader of the Bara Bhuiyan -- the independent petty kings of Bangladesh. 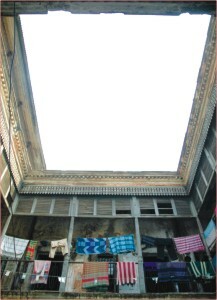 The oldest brick structure that still exists in Dhaka is the one-dome Binot Bibi Mosque at Narinda, built in 1457. Though the mosque survived the onslaught of time and climate for about 550 years, it is now unfortunately being demolished. We are destroying the oldest structure in Dhaka to build a bigger mosque and a madrasa on the site. The second oldest brick structure in Dhaka city is the Mirpur Majar mosque, also one-domed, built in 1487. There was a big fort in Dhaka before it became the capital of Sube Bangla -- a province of the Mughal Empire. Mirza Nathan wrote in his book Baharistan Ghaibi that Dhaka and Gaur were the biggest forts in the pre-Mughal period. Mirza Nathan came to Bangladesh in 1608 as a commander of Islam Khan, who was the subadar (governor) of Bengal appointed by Emperor Jahangir. In fact, the word Dhakka means a "watch station," which may explain how the city got its name. Others say that Dhaka got its name from the tree, dhak (butea frondosa), which used to grow plentifully at this place. Dhaka is located close to two ancient capitals of Bengal, Vikrampur and Sonargaon. So, it was only natural that this place was pivotal to the defense of these two capitals and, as a result, grew into a cantonment town as well as a business centre. Islam Khan became the subadar of Sube Bangla in 1608. At that time, the capital of the Suba was Rajmahal. On being appointed as the subadar, Islam Khan decided to transfer the capital from Rajmahal to Dhaka. He renamed Dhaka as Jahangirnagar after Emperor Jahangir, his mentor, and sent two of his officers along with their subordinates to Dhaka two weeks ahead of his arrival "to put the old fort into a good state of repair, and make it fit to receive the governor." On his way to his new capital, Islam Khan got engaged in fighting against Musa Khan, the son of Isa Khan and the leader of the Bara Bhuiyan, at Ghoragat. The fighting delayed his arrival in Dhaka till 1610 A.D. Musa Khan's tomb, and a mosque built by him, is now located in Shahidullah Hall. In Dhaka, Islam Khan used to stay in the old fort, which is now the Dhaka Central Jail. During his time, Dhaka started growing as a capital. Manrique, who came to Dhaka in 1640, described it as a "great and famous city." He mentioned a Magh raid on Dhaka, which had taken place twelve years before he went there. The Arakanese Magh king, Thudhamma, with the help of the Portuguese, and on the invitation of Raja Kedar Roy, one of the Bara Bhuiyan, landed in Dhaka without any résistance from the small Mughal contingent. The Magh spent three days sacking the city and setting fire to it. However, on hearing that a great force of Mughal cavalry was on the way to Dhaka, they left the city on the fourth day. The Portuguese took away one of the daughters of Kedar Roy, Angelica, who was later traced to St. Helena, an island in the south Atlantic, and helped the British conquer the island from the Portuguese. At that time many Bengalis used to work as khalashis (sailors) on Portuguese ships. Ali was the leader of a group of khalashis who joined hands with Angelica to help the British. Tavernier visited Dhaka in 1666, and wrote: "Dhaka is a great town … The length of this town is about two leagues." Captain Bowrey, who came to Dhaka about twelve years after Tavernier, wrote: "The city of Dhaka is very large and spacious…"
Mir Jumla was appointed the governor of Bengal in 1660. He conducted a successful campaign against Assam and brought two huge cannons from there. They were set on the banks of the Buriganga river, but one fell into the river and was lost forever. The other, called Bibi Marium, was transferred to Chawk Bazar. Sometime in the 1950s, it was brought to the traffic island at Gulistan, and became known as Gulisthaner Caman. Once a famous object, this cannon has become lost in oblivion due to its present inconspicuous location in Osmani Uddyan. Mir Jumla erected the Dhaka Gate, which now stands in good condition near the Doel Chattar. This was a gate on the north entrance of Dhaka. Not much later, Dhaka expanded further north beyond the gate up to Tongi. 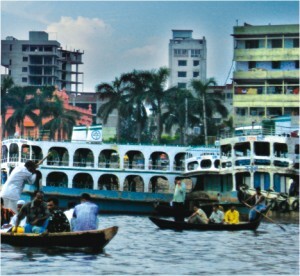 As a capital, Dhaka started flourishing in trade and commerce, which attracted many foreign traders. The city became the main centre for muslin trade. Dutch, French, English, Armenian, and Greek traders flocked to Dhaka to do business and established their own trading houses. With the traders also came the Christian missionaries. 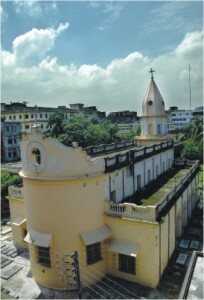 The Portuguese Jesuit Missionary built Dhaka's first church in Tejgaon in 1677. At that time, Tejgaon was a suburb of Dhaka, however, when the city lost its status of a capital and gradually shrank, a thick jungle grew between the city and Tejgaon. In the early 19th century, William Robinson wrote: "Tejgaon is a village … The way to it from Dhaka lies through a dense jungle, once the site of numerous pleasure gardens: the walls of which in many places still remain. This jungle is beautiful in appearance, but it is not passed without danger, it being the habitation of tigers." Prince Azam, son of Emperor Aurangzeb, started the construction of the Lalbag Fort in 1678, but before he could complete it he had to leave Sube Bangla. In his second tenure (1678-1680) as the subadar, Shaista Khan continued the construction of the fort. But on the death of his daughter, Pari Bibi, he abandoned the construction; and the fort remained incomplete. Lalbag Fort is going to be recognised soon as a "World Heritage Site" by Unesco. 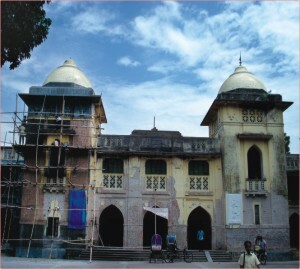 Ibrahim Khan became subadar of Bengal in 1689 and built the Jinjira Palace on the south bank of Buriganga River. A wooden bridge on the river connected the palace to the north bank. Bishop Heber came to Dhaka in 1824 to consecrate the Anglican Church on Johnson Road, to the north of Bahadur Shah Park. He described Jinjira Palace as bigger than the Kremlin Palace in Moscow. After the Battle of Plasy in 1757, Amena Begum and Ghaseti Begum, the mother and aunt of Nowab Sirajuddawla, were kept as prisoners in this palace. On the behest of Miran, the son of Mir Zafar, they were drowned in the river Dhaleswari. A few decades ago, there still remained some remnants of the ruins of the Jinjira Palace, but today there is no trace of the building left. Prince Azimushan, grandson of Emperor Aurangzeb, became the subadar of Bengal in 1697. The Emperor appointed Murshid Kuli Khan as the dewan of the Suba in 1700 A.D. The subadar used to live in Rajmahal, and the dewan in Dhaka. The relation between the subadar and the dewan was extremely bad. Azimushshan made a futile attempt to kill Murshid Kuli Khan in 1704. For the safety of his life, Murshid Kuli Khan immediately shifted his office from Dhaka to Murshidabad. When in 1717 he was appointed the subadar, Murshidabad became the capital of Bengal, though Dhaka remained as a seat for a deputy governor. Murshid Kuli Khan built a beautiful mosque at Begum Bazaar. Some famous Mughal buildings in Dhaka are: The tomb of Pari Bibi (1684), Bara Katra (1664), Choto Katra (1663), Husaini Dalan (1642), the Great Idgah (1640), Churihatta Mosque (1649), Satgombuz Mosque (1680), Khan Muhammad Mridha Mosque (1704), etc. Bara Katra and Choto Katra are now on the point of destruction. The mosque of the Great Idgah at Dhanmondi has been defaced in the name of extension. With the loss of its status as a capital, Dhaka started declining fast. During the time of Shaista Khan (1644-77 and 1680-88), Dhaka city extended along the Buriganga River for about 10 miles. Rennell's map of Dhaka, published in 1780, showed that the extension of the city shrank to only about four miles. The lithographs and sketches of Dhaka City done by Sir Charles D'Oyly, who came to Dhaka in 1808 as the collector of the East India Company and left the city in 1824, show how the city lost its glamour and was almost in ruination by that time. During the Mughal period, two rivers -- Dulai and Pandu -- used to flow through the city. The Dulai river gradually turned into Dholai khal (canal), and lohar pul (Iron Bridge) at Gandaria was over this river. There was a bridge on the Pandu river, known as Ambar Shah Bridge, which connected Shahbag with Kawran Bazaar. The deep and dry canal in Paribagh, and the Begunbari khal (canal), which is now being excavated, are actually parts of the course of Pandu river. The Pandu river had at least two branches to the south, which led into the Dulai river. One branch flowed east of Suhrawardy Uddyan in a southeastern direction. The trace of the other branch was visible even a few years back between Nazimuddin Road and Dhaka Medical Collage. Chankhar Pol was on this branch. The Dulai and Pandu rivers have been erased by land-grabbers. It seems it is now the Buriganga, Turag, and Balu rivers' turn to become obliterated. At the partition of Bengal in 1905, Dhaka was made the capital of the newly formed province of East Bengal and Assam. But, it was short-lived. In 1912, King George V at Delhi Darbar annulled the partition of Bengal, and Kolkata became the capital of united Bengal; at the same time the capital of the British-India Empire was transferred from Kolkata to Delhi. 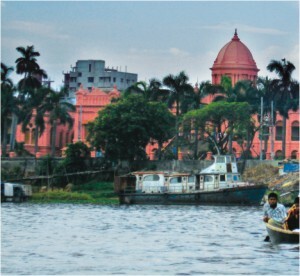 Dhaka was compensated for its being stripped of the status of a capital with the establishment of Dhaka University in 1921. The residences built for the teachers of the university on Mintoo Road are now being used as the residences of ministers. As Old Dhaka is the Mughal part of Dhaka, the Ramna area is the British part. Some landmark buildings in Dhaka built during the British period are: Northbrook Hall, Ahsan Manzil, Rup Lal House, Curzon Hall, Old High Court Building, etc. Curzon Hall, now a part of Dhaka University, was originally meant to be a town hall. The Physics Building built to the west of Curzon Hall during the Pakistan period is so ugly that the two buildings standing side by side make one remember the phrase "the beauty and the beast." The British left the Indian sub-continent in 1947, and Dhaka became the capital of East Bengal -- the eastern wing of Pakistan. In 1956, East Bengal was known as East Pakistan. Later, with the emergence of Bangladesh as an independent country in 1971, Dhaka resettled into its role as the capital of the country. Faruque Hasan is a Forum contributor.